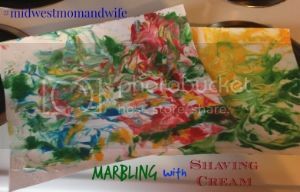 I came across another fun and easy activity on Pinterest … Marbling with Shaving Cream! There are all sorts of tutorials on Pinterest for this activity. I used this site as a guideline. This is what we did! 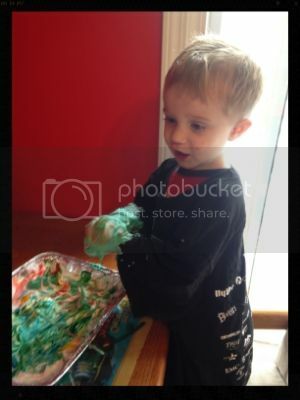 Foam shaving cream – I always have several cans on hand because there are so many activities that use shaving cream! Shallow dish – You can use a 9×13 glass dish or pan. I have some foil ones, I have kept for other activities I’ve done. Food coloring – You can use water color paints, tempera paint, etc. Whatever you may have on hand. Thicker paper – You do not want to use regular printer paper, otherwise it wont hold up well. We used 8×10 white card stock. 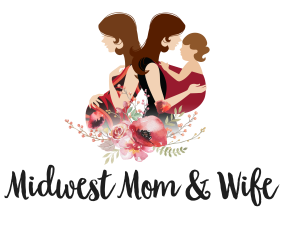 A wooden dowel – I happened to have this on hand and it worked really well for swirling, You could also use a plastic knife, popsicle stick, a finger (that may get messy). Whatever you think is best! Butter knife – You use this to scrape off the excess shaving cream off the paper. 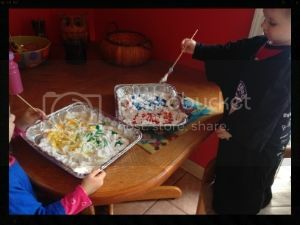 Squirt shaving cream into your shallow dish and squirt several colors of food coloring into dish. Give child a wooden dowel or whatever utensil they will be using for swirling. This quickly became a sensory activity 🙂 Monte really enjoyed the feeling of the shaving cream. Good thing I put them in their painting shirts! 4. Once they are done swirling and creating their design. Take your piece of paper and place it down into the shaving cream. Press it down with your hand. Then slowly pull it up. 5. Flip it over, take your butter knife, and scrape off the extra shaving cream over the sink. 6. Set it to the side and let dry! This is one Pinterest project that was easy and actually turned out how it was supposed to! I also had everything on hand!